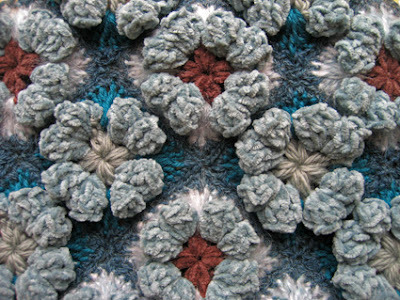 granny squares | Hello Craft Lovers! Still in bed. Mini-crafted a crocheted bracelet for my wrist watch. Six mini granny squares, held together with sterling silver rings. Not very practical… but maybe cute. While I’m at the Gallery working with other things than crafting over the weekend, I would love if you entered my Give Away. Just comment at the post about it before Sunday 00:00 o’clock the night to Monday (the 28th)this weekend. (Stockholm time). During the night I had my 3000nd visitor! It’s amazing THREE THOUSAND visitors, it blows my mind! I’m so happy for all of you that has visited me and all of you that has listed me in your blogrolls. Nice people posted my stuff on Makezine & Craftzine (great webMagz check them out) My flowers on a stem was in Dagens Nyheter (Sweden’s largest morning paper) and my lovely brother did a shout out on his super funny blog (Swedish blog). Thank you all! I love that you helped me to make this connection with all you fellow crafters out there. Went on vacation without a craft project – forgot my craft-bag – so I found this yummy thick paper gift-wrap string and a nr7(millimeter) crochet hook at the supermarket in Borlänge City. Vibrant colors. Love texture, so I crocheted standard granny squares and they have a great bulky feel. They turned out big, each is 22x22cm (approx 9×9 inch) with 4 rows. Put six together to make a carpet 68x45cm (27x18inch). I will ship this carpet to you anywhere in the world. Just make a comment on this post before 00:00 (Stockholm time) the night to Monday 28th of January (I give it a little time because I’m not sure someone really wants it :-) If it’s more than one person posting, I use ”random.org” to draw lots. You don’t have to formulate anything if you don’t want to – just post somewhere I can get a hold of you. Don’t worry I won’t send you my worn floral folklore clogs :-) It’s just for the image. If you are interested in folklore as The Dalahorse and clogs like this – check this site out.